In this issue of The Woolf we launch our Poetry Competition, which is why we wanted to interview a poet from Switzerland. June’s theme is ‘High and Mighty’ and that has a certain relevance. Poetry seems to be considered a higher and more rarefied art form than prose. Do you see it that way? Perhaps it’s in the eye of the beholder; any writing that grabs me and makes me dread the last word—whether it be poetry or prose—is what I’d classify as rarefied art. Sometimes poetry, however, suffers from its ‘high and mighty’ or aloof reputation. Perhaps this is due more to poor teaching methods, rather than to poetry itself. In my case, I loved poetry as a child, thanks to my mother who read fun poems to me, wrote poems herself, and got me writing them for pleasure. When I was presented to old-school poetry in high school, however, poetry and I shunned each other. It transformed into an impossible code to crack and my own poetry suddenly looked silly; I put it back in the play box with my other childish things. On a more positive note, ‘high and mighty’ could refer to the mysterious source of poetry. In my case, I have no idea where it comes from, or when it ‘might’ show up. I imagine it floating around up ‘high’ somewhere, looking for a safe place to land. My role, as a poet, is to remain aware and available, ready to write should it choose to come to me. My experience as a reader of/listener to poems was love, passion, cooling and renewed ardour, but I grew up in Wales, where verse is regarded as our birthright. How far was your youth influenced by the mighty American poets and a sense of pride in what our language can do? My experience with poetry as a youth was playful. As mentioned, my mother introduced me to poetry when I was very little. We had fun with Silverstein, Sandburg, A.A. Milne, Stevenson, and Seuss. The greatest honor in the family was, as soon as you were able to read well enough, tp be asked to read “The Night Before Christmas” to the entire extended family on Christmas eve. Of course, everyone older knew the poem by heart and chimed right in without the slightest hesitation, so we all were very keen and proud to read. After I went off to school as a teenager, communication with my mother was primarily by letter; in many of hers, she’d transcribe bits of Bishop, Rilke, Sarton, Rumi, e.e. cummings, Moore, Rich, or Dickinson, among others. I’m ashamed to say that I remember rolling my teenaged eyes at some of those passages—but thank goodness she sent them! The only other poetry I remember being exposed to at the time was an endless version of “Sir Gawain and the Green Knight”. If that wasn’t rough enough, it was followed by Chaucer’s “The Wife of Bath’s Tale.” Talk about high and mighty! I still have the textbook and when I look at my desperate notes in the margins, I cringe. How did that sense of identity and ownership of language change after your move to the French-speaking part of Switzerland? Can you enjoy Francophone poetry to the same degree? I haven’t lived in an English-speaking country since 1988. Ever since then, English has been my refuge. At times, as far as communication goes, living daily life in another language (French, Spanish and Cantonese) has been a bit like having my shoes tied—to each other. Sometimes I stumble and shuffle along. With determination, and a good smile, I eventually get where I need to go. But it can be frustrating, and I often long for an easy carefree run in the woods. Writing in English—expressing myself clearly—with words that I own and that aren’t borrowed, feels like a good run, even now, after living in French-speaking Switzerland for 22 years. I thoroughly enjoy reading novels in French, and wish I could enjoy Francophone poetry to the same degree. I’m incapable of doing so. Even though I hold an MA in French, and am supposedly fluent, French can still get a bit ‘high and mighty’ when it gets around me—or when I step into the thick of it. However, I’ve learned not to fight with French anymore and can even laugh at my spectacular failures—more on that in my essay, Mastering French, which was recently published in Tales from a Small Planet. Your blog contains a wonderful image of the huge, sprawling oak of ideas whittled down to its essence, an acorn. How do you go about reducing an amorphous set of thoughts to a few hard-hitting lines? Thank you! Sometimes, the constraints of haiku and senryū help me get to the essential of what I’m trying to say. Limited lines and syllables make word choice especially dear. Some of my haiku come from pages and pages of notes. 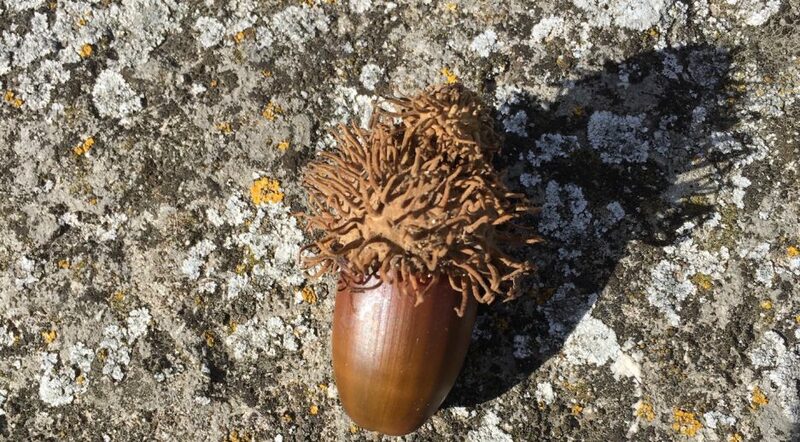 The title of my blog, Oaks to Acorns, reflects that thought process; when I write poetry, it’s an attempt to reduce an oak (something huge and unwieldly) to a simple acorn (something manageable that anybody could hold in their hand). To get to the essential, and put a vast and complex thought into a nice neat shell, is one way I reconcile my worlds. Old-school poets have a pretty romantic/tragic image as solitary figures expressing a personal reaction to the world. Geneva Writers’ Group offers plenty of opportunities to learn the craft and meet other writers working in all forms. You also took part in NaPoWriMo (National Poetry Writing Month). What do you gain from these writerly connections? The Geneva Writers’ Group (GWG) pulled my poetry out of the old play box and onto the dance floor. While swirling around with all sorts of writers, I mustered up the courage to tap on the shoulder of The Frost Place. After a few shots at publishing, I headed over to Middlebury College’s Bread Loaf in Sicily Conference. My dance card filled right up when NaPoWriMo featured one of my poems in 2015, again in 2017 and, just recently in 2018. It’s incredible to be in contact with poets from all over the world who also ‘play’ poetry. Who knew? By the way, most writers I know are party animals—they may prefer solitude when they write, but when they gather together, well, let’s just say, anything goes. Thanks to the GWG, and the Pernessy Poets in Lausanne, I’m constantly gaining not only confidence, knowledge, advice, feedback, and the joy that comes with a sense of kinship—but also, since the writers I know like to nibble and sip deliciousness when we gather, a lot of weight. Much of your work comes from a personal perspective. Do you think poetry encourages a more subjective take on experience, inviting the reader to identify, rather than an overt attempt to entertain? I suppose so; I’ve never fact-checked my poetry and it is entirely from my perspective. Just as some people do needlepoint, or play rugby or video games to entertain themselves, I play poetry. In short, it’s one way I entertain myself. If others find my writing entertaining, then it makes me even happier. Let’s talk about the haiku. An impressive woman once told me it is the best way to condense an experience. But this quote from Chris Harris is a criticism of teaching children poetry through haiku: “If we can help kids think of poetry as expansive rather than constrictive, they can discover just how many directions there are to explore.” What’s your take? I agree with Chris Harris that children should be encouraged to ‘play poetry’ without limits—unless the child finds this overwhelming and then, why not provide haiku as an option? I don’t believe there is any one form that could suit every age universally, but I do believe there is a form (which may be form-less) out there, somewhere, for everybody. Harris’ poems are of the sort I enjoy best—they’re the bubbles in the bath. They make me kick back, relax and let the child inside have good giggle, along the lines of Silverstein or Sandburg. On that note, if there are any adults out there who were forced to write or swallow unwanted poetry in some academic institution, like I was, may I suggest you try again, at least once, with just one poem, An Introduction to Poetry, by Billy Collins? All writers tinker and twiddle before they are ready to send a piece of work out into the world. Surely poetry is much harder? You are crafting a delicate piece of jewellery, weaving precious stones and metals into something beautiful. When your only materials are words and your tools your imagination, when do you know when to stop? Good question! I don’t know if poetry is any harder to work with than prose; my first novel was a six-year revisionary disaster. I never did manage to form anything resembling a delicate piece of jewellery, draft after draft. Pity my poor writing group at the time! Finally, The Woolf special question: Which work of fiction, including poetry, means most to you, and why? For fiction, John Irving’s A Prayer for Owen Meany for its honest physical and spiritual portrayal of my New Hampshire roots; I’ve reread it at ‘the worst of times’ for comfort and it always gets me where I want to go. As for poetry, I could never choose just one; my bottomless play box holds poetry collections by Vievee Francis, Elizabeth Bishop, Sharon Olds, Kay Ryan, Charles Simic, Naomi Shihab Nye, Rilke, Susan Hylen, Ross Gay, Carol Ann Duffy, Robert Frost, Aracelis Girmay, Sarah Browning, Carmen Bugan, Laura Kasischke and, of course, my mother, Eve Hamblett Cassatt … to name just a few. To feel this pleased for the daughter of one of my best friends feels like being pleased for one of my own. That’s some pleased! Congratulations! This is a major achievement! Quite a shock for me! Thanks. Well-deserved interview, Poet from Switzerland with the beautiful garden (and the blowsy tulips)! I’ve definitely missed reading your lovely NaPoWriMo offerings, they were such a breath of humour and fresh air. Thanks so much for the encouraging words! I’m still writing and trying to get a collection published so haven’t posted many poems — if all is rejected, I’ll be posting loads here and start a new collection to send out. I look forward to hearing that your collection is published, and I will be one of the first in line to try and get a copy! I hope the garden is doing well.